A GOAL in each half eased Dover’s relegation fears as Andy Hessenthaler’s men won in windy conditions at Crabble on Saturday. Alfie Pavey’s close range finish and a goal direct from Anthony Jeffrey’s cross had Whites in control just after the hour mark. Matty Kosylo headed home to set up a nervy last 25 minutes for the hosts, however Athletic held on to move five points clear of the National League drop zone. Town’s Nathan Clarke too an early shot on from a corner, but volleyed narrowly over. 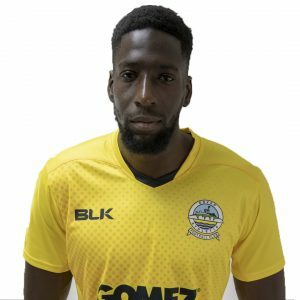 Dover went for goal twice in quick succession, with long-range efforts from Bedsente Gomis and Jeffrey going straight at visiting keeper Sam Johnson. Town’s stopper then beat away Mitch Brundle’s fiercely struck free-kick and then grabbed onto Stuart Lewis’ follow-up volley from the edge of the box. 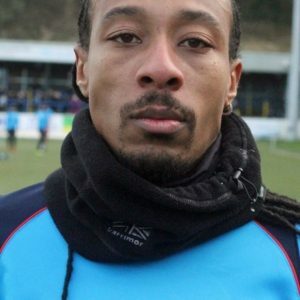 Home keeper Lee Worgan dived low to tip away Devante Rodney’s bottom-corner bound drive and Jeffrey was off target at the other end with a curling effort over the crossbar. Pavey, in search of his third National League goal of the season for Athletic, saw Johnson pat down a 30-yard strike. And the striker made no mistake with his next chance on 25 minutes. Jai Reason weaved past two defenders and laid the ball off for Pavey to fire past Johnson from a inside the penalty area. The Halifax defence were clearly aggrieved by the opener, but their claims of handball against Reason were waved away by the referee. The midfielder then nearly turned goalscorer, sending a scorching volley just wide before the break. Hessenthaler’s team were nearly made to pay for missing their chances 10 minutes after the restart. Danny McNamara’s stumble allowed Kosylo to break clear, however Worgan blocked the winger’s shot with his legs. Pavey poked wide after Bobby-Joe Taylor’s free-kick struck the wall, but Athletic had the lead in fortuitous circumstances on 61 minutes. Taylor surged forward and passed to Jeffrey to whip in a cross which passed a stunned Johnson and into the bottom corner. However the points were not safe as The Shaymen pulled a goal back three minutes later through dangerman Kosylo. A long kick by goalkeeper Johnson made it’s way all the way up to Dover’s penalty area for Kosylo to head over the onrushing Worgan and into the net. Kevin Lokko almost restored the two-goal advantage, heading over Taylor’s corner. Cameron King robbed McNamara and set Manny Duku clear, only for the substitute to slip at the crucial moment and send the ball wide of the mark. 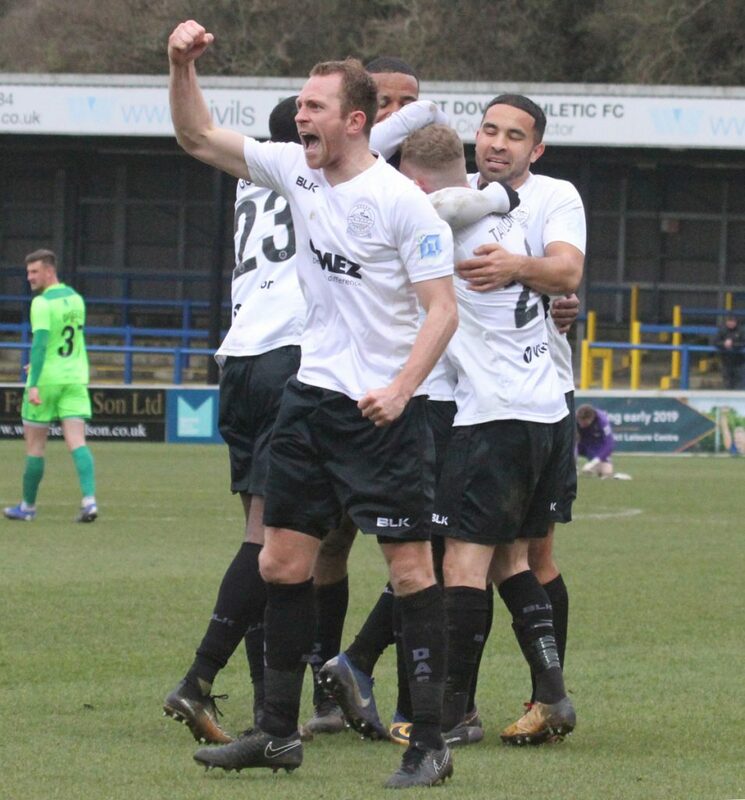 There were cries of disbelief from the home crowd when the fourth official showed six minutes of injury time on the board, but Whites held on to extend their unbeaten home run to three matches. Earlier, boss Hessenthaler kept with the same side that drew 1-1 with Boreham Wood at Crabble on Tuesday night. Whites next travel to Dagenham & Redbridge in the National League on Tuesday 26th March, kick off 7:45pm.